Here's the full 24-minutes-long 911 tape between the California Highway Patrol dispatcher and the runaway Prius driver. Dissect away. NSFW language. 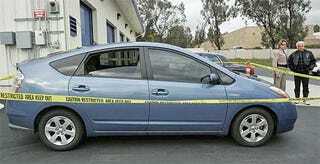 Runaway Prius 911 Tape: "I&apos;m Over 90!" No one was damaged in Monday's runaway Toyota Prius incident and the Highway Patrol was able to talk the driver, Jim Sikes, to a stop. He spent more than 20 minutes on the phone with a dispatcher who attempts to help him stop the car. It's unclear what the specific procedures are for this type of incident. The dispatcher first asks his name, where he is, what type of car he's driving and what's his phone number. Once the car is identified as a Toyota Prius and Sikes explains he's driving near 80 MP the unnamed dispatcher asks him if he has a floor mat issue. After getting nowhere with that line of questioning she asks if he can put the car in neutral. Dispatcher: Have you tried to put the car in neutral? Dispatcher: Can you try that? Sir? Can you try to put the car in neutral? Sir? Jim? Jim? Jim? Sikes: It's not doing anything. Eventually, she asks him to turn the car off which is the next proper step according to Toyota's response guide. At 80 MPH you're traveling approximately 117 feet-per-second or the distance of a football field in less than three seconds. The risk in advising someone to turn the vehicle off is it removes the ability to use the power steering and is done as a last resort. Sikes clearly drops the phone at numerous points in the conversation, making it difficult for him to hear any of the advice. The dispatcher also asks him if he can switch the car out of gear at numerous points, which is the suggested as the first step. Why wasn't the car able to shift into neutral? It's unclear. It's possible there was a mechanical issue or perhaps the user just wasn't able to use the complicated gear shift lever pictured above while he was so freaked out.